Lewisville is located directly off I-35 E, 30 miles north of Dallas, and less than 15 miles from DFW Airport via Highway 121. This makes Lewisville ideal for the person wanting to have all the conveniences of the large city, but not wanting to deal with the day-to-day congestion of the big city. The city of Lewisville strives to provide their residents with a well-rounded community. From old Texas charm, to outdoor activities, to shopping and dining, Lewisville has it all. Old Town Lewisville is the area in which the city was founded, and the original structures have been retained creating a fun, old-western ambiance. An open farmer’s market is held here, where farmer’s sell their locally-grown fruits and vegetables. The city maintains 23 parks and there are multiple outdoor sports fields throughout the city. The Vista Ridge Amphitheater is a great place for residents to come together for outdoor concerts and activities. Being located on Lewisville Lake, residents of Lewisville are spoiled with year-round open marinas and a great way to beat the heat during the Texas summers. 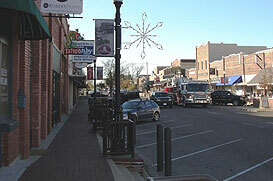 Residents also have great shopping and dining choices. Vista Ridge Mall provides over 1,000,000 square feet of retail space, along with a 12-screen movie theatre, and I-35 E is lined with delicious eating options on either side. Lewisville also put as much effort in the development of the city as they did into the school system. For 2010, all schools in the Lewisville ISD received either “Exemplary” or “Recognized” ratings. The city of Lewisville has done an excellent job in planning a city that morphs old charm and urban convenience.